Really? Yes, do you ever ask yourself whatever happened to an old friend who used to live in the UK or Eire ? I know we all do. Do you ever worry about an old friend – people you once knew – relative – comrade – school mate or even a work colleague whom you’ve lost touch with in the UK. Most of us have someone or some people in our past lives we would like to find again after many years. After all, most of us aren’t very good at keeping in touch, right? You know how the years go by …. addresses and telephone numbers get lost. Luckily you are already very close to finding that old friend again, using my people finder site. the last location you definitely know they lived in. Take my experiences for example. Recently I sat down to eat with an old army comrade I hadn’t seen for over 50 years – he had lost his wife and was very pleased to see me. Like so many others he had changed his address and I had never kept in touch. After this discovery I went through all the old names I had kept in 1948 and just with the initials and surnames it was possible to find half these people still alive from my earlier army life. 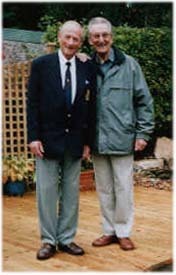 Robin with his latest “old pal” Bill Lings not seen since his Army days in Berlin 55 years ago and recently found through the Internet. I’ve had 4 children from 2 marriages. I had brought up the eldest well but did not have any jurisdiction over my second son. Eventually I lost contact through no fault of my own but now I’ve found him again after 30 years ! All I have to do is check out the address in person ..
How did I find the address ? By gathering and buying a complete set of data on the whereabouts of everyone in the United Kingdom. What’s the difference between other large People Finder sites and this tiny one? It’s service. I personally know what it’s like to search and find an old friend. So many people are simply overwhelmed when they approach a large ‘people finder’ portal site … they don’t believe anyone really cares ? I do. I want you to find your old friend. I have been in your shoes. I make sure I OVER deliver. I’m only happy if you are completely happy with the information I send you.